← The “Bitcoin-Standard” of Encryption is Now On Your PC: Signal for Desktop! The 2009 winner, Ron Paul, was the overwhelming favorite having taken 52% of the vote. From 2010 to 2014, the votes have been much closer and resulted in multiple winners. Adam Kokesh, Iraq Veterans Against the War (IVAW) and Private Manning receiving the 2010 FPP Peace Prize. Angela Keaton and AntiWar.com won the 2011 FPP Peace Prize. Scott Horton, Ian Freeman and Julian Assange were awarded the 2012 FPP Peace Prize. Pete Eyre, Derrick J Freemen and Edward J. Snowden were winners of the 2013 FPP Peace Prize. Ross Ulbricht and Fr33 Aid were recognized in 2014 for their work towards a more free and peaceful society. 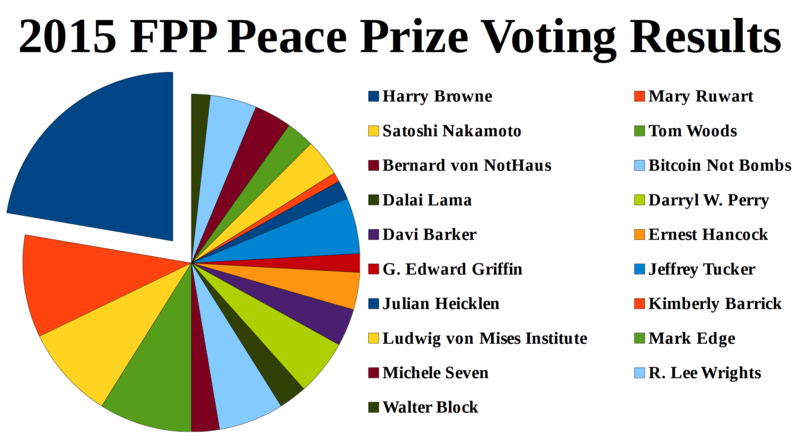 For the first time since 2009 there is only one recipient of the FPP Peace Prize, and like the 2009 winner, Ron Paul, the 2015 FPP Peace Prize winner is a former Libertarian Presidential nominee, and to date the only two-time Libertarian Presidential nominee, having carried the Libertarian Party banner in 1996 & 2000. After his Presidential runs, and before his death in 2006, the 2015 FPP Peace Prize winner helped found the American Liberty Foundation in 2001 which became the Downsize DC Foundation in 2004. The legacy of this man lives on, and it is my pleasure to announce the winner of the 2015 FPP Peace Prize is Harry Browne!